For Jill Mathias, simple is how she describes her passion for cooking. She has such an appreciation for the bountiful area we live in, and taking new ideas directly to the table is truly a challenge she enjoys each day. Jill grew up on the border of North Dakota and Minnesota in Fargo Moorhead. While studying Art History, she enjoyed entertaining for friends and soon realized cooking was more fun than Art History. She attended culinary school in Charleston at Johnson & Wales. Then her training continued while living in Puerto Rico, Seattle and Martha's Vineyard. Jill returned to Charleston and worked at High Cotton briefly before joining Carolina's as Sous Chef under the keen eye of Jeremiah Bacon. 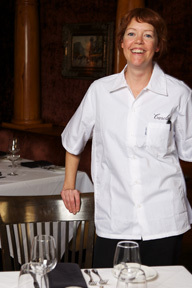 Jill's creativity, professional technique and passion for food has earned her the role of Executive Chef at Carolina's. She may call herself simple, but she has already proven to be a rising star and will continue to bring mouth-watering creations to our customers here at Carolina's.